IDEF0 is a modeling tool used to model the decisions, actions, and activities of an organization or system. Diagrams are a major component of an IDEF0 model. 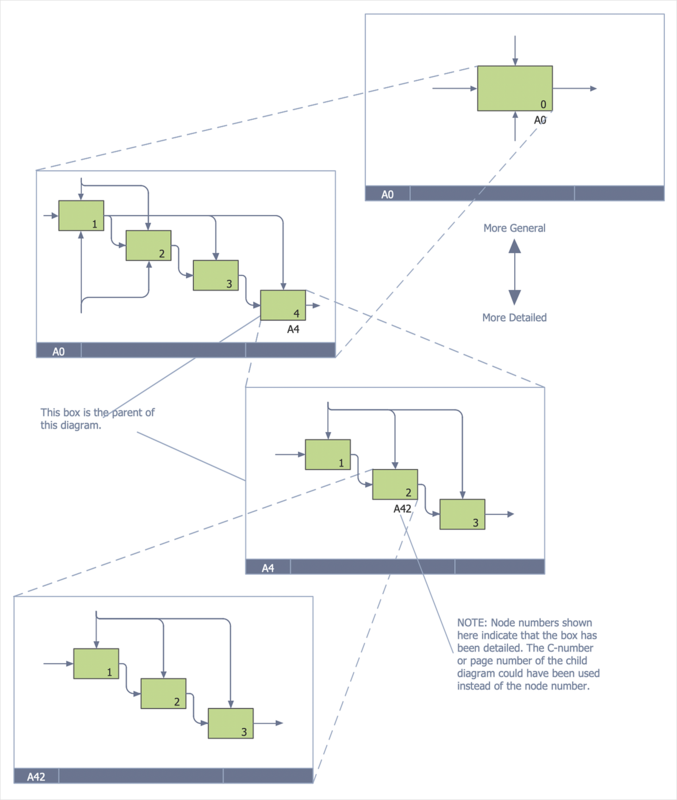 ConceptDraw DIAGRAM allows you to create professional IDEF0 Diagrams using IDFE0 notation supplied by the IDEF Business Process Diagrams solution. This solution is a paid add-on to ConceptDraw DIAGRAM, that provides individuals with extensive new libraries and objects to assist in IDEF process definition at an economical price. Open a new ConceptDraw DIAGRAM document and select the IDEF0 diagrams library. An IDEF model is made up of several diagrams. Each diagram describes in more detail a box from a more general diagram. It can be started from the Diagram Form element. To make changes to IDEF0 shapes use the Action button menu. To open the menu select an object and click the button in the upper right corner of the object. Connect IDEF0 elements with arrow connectors composed of one or more arrow segments, that depicts data transmission channels. Result: An IDEF0 diagram is used to model business functions: data flow, system control, and the functional flow of a process. Using ConceptDraw DIAGRAM you can easily create and communicate IDEF0 diagrams of any complexity.